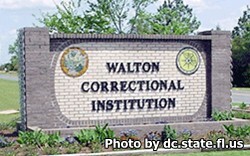 Walton Correctional Institution is located in De Funiak Springs Florida. It is a level IV facility that houses up to 1,200 male adult offenders of closed, medium and minimum custody levels. Inmates incarcerated here can earn a basic adult education, and GED. Offenders can also obtain vocational skills including carpentry and cabinetmaking, and in heating ventilation and air conditioning. The Chaplains office offers inmates religious studies and worship services as well as substance abuse counseling and treatment through programs like Alcoholics and Narcotics Anonymous. Re-entry programs at this facility help inmates to be better prepared for their eventual release by offering career and interview skills, writing classes, and public speaking skills. Visiting is on Saturdays and Sundays from 9am-3pm Eastern Standard Time. Registration for visiting starts at 8:15am and ends at 2pm. If you do not arrive by 2pm you will not be allowed admittance to visitation. All visitors must be approved by completing a visitors application before they attend a visiting session.